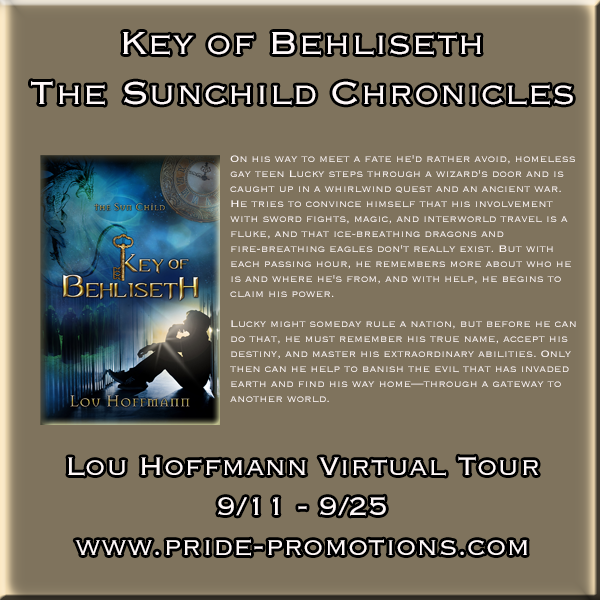 Trisha Harrington's Blog: Lou Hoffmann Key of Behliseth Blog Tour - Excerpt and Giveaway! 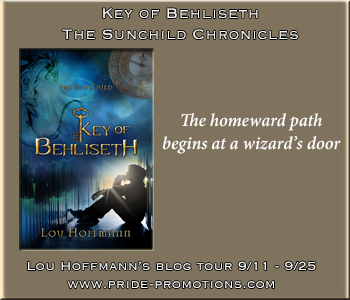 Lou Hoffmann is here today to share an exclusive excerpt from her new YA novel, Key of Behlisheth! Author Bio: Lou Hoffmann, a mother and grandmother now, has carried on her love affair with books for more than half a century, and she hasn’t even made a dent in the list of books she’d love to read—partly because the list keeps growing as more and more fascinating tales are told in written form. She reads factual things—books about physics and stars and fractal chaos, but when she wants truth, she looks for it in quality fiction. Through all that time she’s written stories of her own, but she’s come to be a published author only as a johnnie-come-lately. Lou loves other kinds of beauty as well, including music and silence, laughter and tears, youth and age, sunshine and storms, forests and fields, rivers and seas. Proud to be a bisexual woman, she’s seen the world change and change back and change more in dozens of ways, and she has great hope for the freedom to love in the world the youth of today will create in the future. 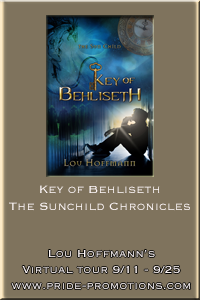 Author Contact: You can find Lou on facebook at https://www.facebook.com/lou.hoffmann, or twitter @Lou_Hoffmann. 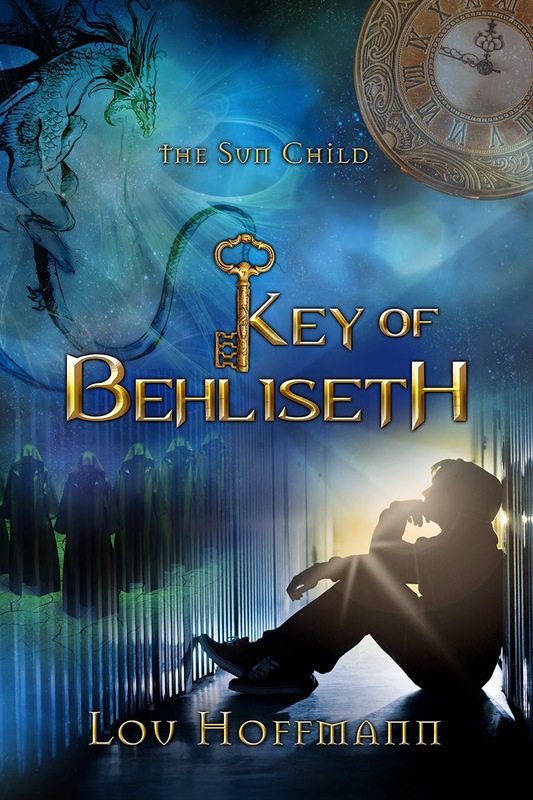 Isa left her four Ethran servants to tend the boy until she could return and summoned her recent Earthborn recruits. She gathered them in the vast circular sanctum, the better to show them their insignificance, to inflame their need to serve the Demon Queen. She preferred dimness and shadow, but weaker, ordinary eyes needed light. With a dark word and a flick of thin, sharp fingers, she set a ring of torches burning behind them, blue and cold. She stood tall in the center of the space, robed as always in blue. Acolytes surrounded her, all Earthborn and easily enslaved by magic. They numbered fifty-two, and huddled in kneeling quadrants of thirteen each. Not as many as she would have liked, but a fair number considering the limitations of time. Mordred waited in the dark outside the circle, bearing a small stone dagger and a mirrored tray holding four large crystal goblets. Each cup contained a potion brewed of red elder, skullcap, bindweed, and rue. As Isa had taught him, Mordred had, in each cup, drowned a wolf spider and weighted it with moonstone and jet. The final ingredient, the one that would bind them to Mordred, and through him to her and to Mahl, would be added later, in ritual sacrifice. Having earlier cast a glamour to mellow her voice and visage, Isa lifted her draped arms and bade the supplicants raise their eyes. She began to speak, preaching with a rhythm and flow designed to mesmerize. As eyes glazed in the audience, she blended her words into Dark Chant, low and guttural, sending shadows into their hearts to bleed them of heat. The last syllables of the spell echoed into the vastness of the sanctum. From the slaves, no sound, no movement. “Mordred,” she called, and all heads turned to follow him as he came forward, placed the tray at her feet, and went to one knee. He turned the knife and offered it. She took it and then pulled him to his feet, raising his hand to present him to the gathering. “Here is your captain,” she said. All bowed their heads, and a slow smile of satisfaction twisted Mordred’s face. His eyes glittered in anticipation of new power. After a moment, Isa instructed the Earthborns to stand in their places. 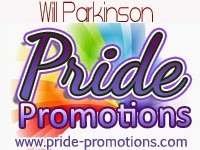 “As is proper, your captain will fortify you with his own strength, through his own sacrifice. 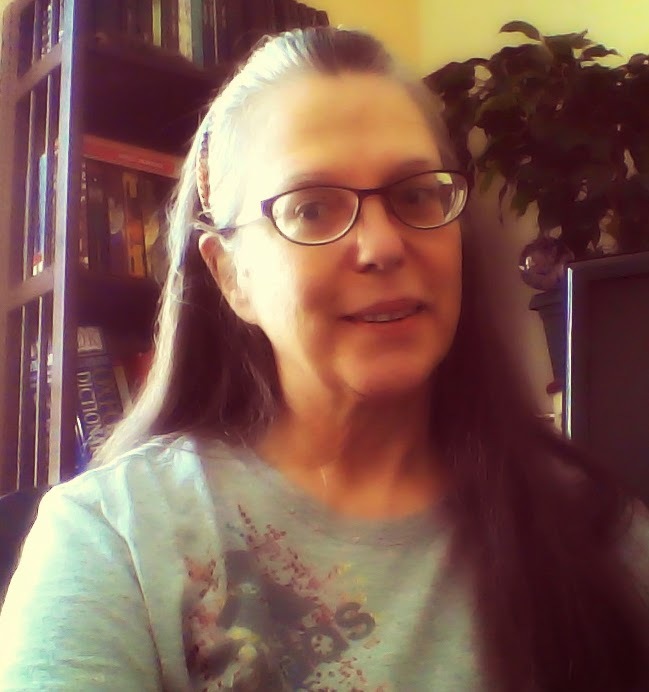 He knelt again before her, and she drew the knife three inches down each of his forearms, turning the knife to slide under the skin and increase the flow of blood. The smile didn’t leave his face. He uttered no sound. He held his arms over the tray and let his blood, dark with the taint of Mahl, fall into the cups drip by drip. Mordred stood, bearing the tray, and waited while she instructed the supplicants. Isa had named a leader for each quadrant of thirteen, a person with some small portion of magic underlying their greed. To each of these four, while his tarnished blood still flowed down his arms, Mordred entrusted a crystal goblet. They did not drink first, but passed the cup each among their twelve. When all the others had partaken, the leaders took the cups again and drank, draining every drop of potion until stone and spider fell upon their pallid lips, a sorcerer’s kiss. The house, floating in a sea of unkempt lawn, didn’t appear foreboding. It was large but loosely assembled, with one thing hooked to the next as if every room was an afterthought. And the skinny square tower poked up stories higher than the rest, looking ready to fall any minute. The front door, on the other hand—a massive panel carved with unknown symbols, fitted with black iron hinges and a golden doorknob—did look foreboding. It no more fit on this decrepit house than the house fit in this posh neighborhood or than combat boots fit on an old man with gray sweats and weird clocks. But there the door was, regardless, and if there was anything Lucky was sure of, standing there peeking through the juniper fronds, it was that he did not want to knock on it. He stepped out from behind the juniper, no longer caring if he’d be seen by the people inside the house. With the hot sun beating on his shoulders, he stood staring at the door, wondering at it. Why would such a place exist? Why would he have been led to it?